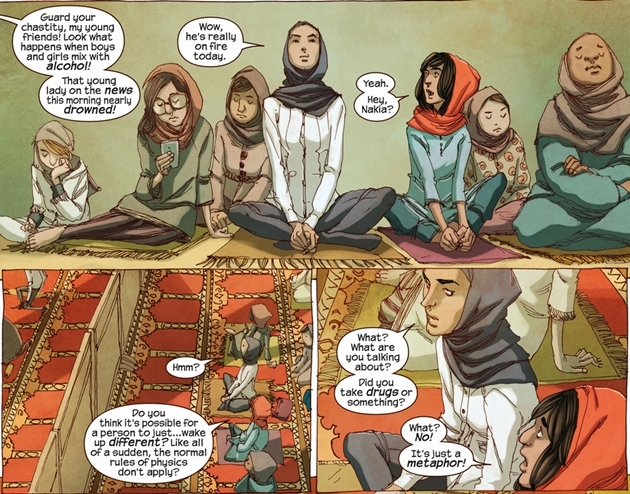 This month, we take a closer look at Ms. Marvel: No Normal by G. Willow Wilson and Adrian Alphona. 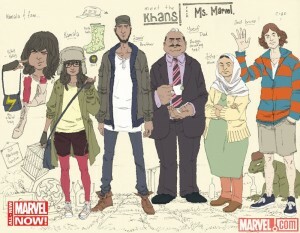 In this Marvel reboot, Kamala Khan, a 16-year-old Muslim girl from Jersey City, New Jersey becomes the new Ms. Marvel. Wilson, Alphona, and the Marvel team create a modern twist offering fun and diversity for tween readers and beyond. 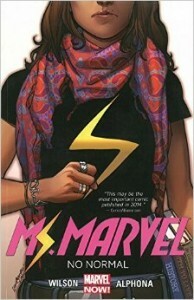 Ms. Marvel is a finalist for the first Dwayne McDuffie Award for Diversity (nominees range from independent to mainstream comic books) and one of YALSA’s Top Ten 2015 Great Graphic Novels for Teens. It is also one of YALSA’s 2015 Quick Picks for Reluctant Young Adult Readers. Ms. Mavel: No Normal encompasses the first five issues of Marvel’s new reboot. 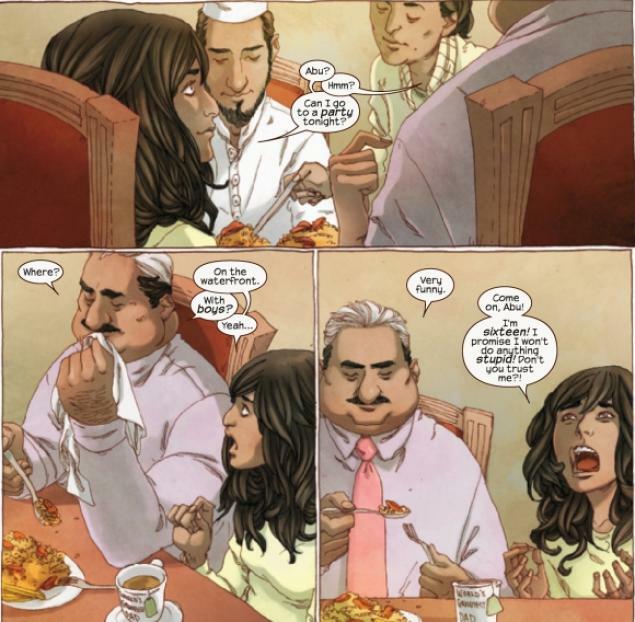 It features a Muslim Pakistani American superheroine who struggles with identity issues whether she’s in or out of her costume. Kamala’s polymorph superpowers — which mean she can change her shape, size and form — are a wonderful metaphor that reflects her inner struggles as she stretches, bends, and recoils from the pressures all around her. 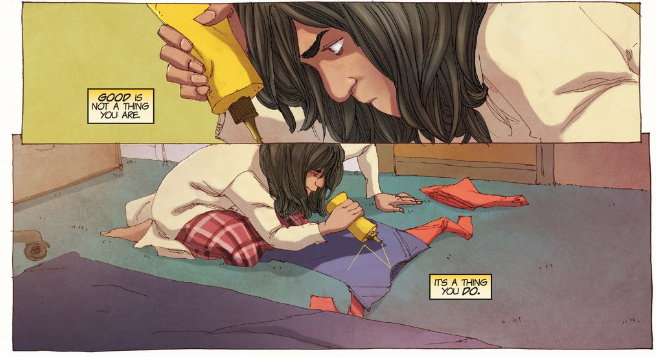 Throughout this volume, Kamala Khan not only struggles with her identity, but with the different ways and expectations of her religion, with the pressures and expectations from her strict (but nurturing) parents, and with her power as well. Throughout all these conflicts, Kamala must also be careful as a polymorph to not be all things to all people, which in the long run, might be very dangerous. The readers, while passive observers, can’t help but be drawn into this story. Despite Kamala’s diverse cultural background — or maybe because of it — she’s in many ways also a wonderfully typical teenager, wrestling with being a Jersey City girl who happens to come from a modern religious family. Like most teens, she’s just trying to figure out how to fit in. Throughout this book, the text provides wonderful insights into Kamala’s thoughts and character, while moving quickly along. The art is equally engaging and inviting. 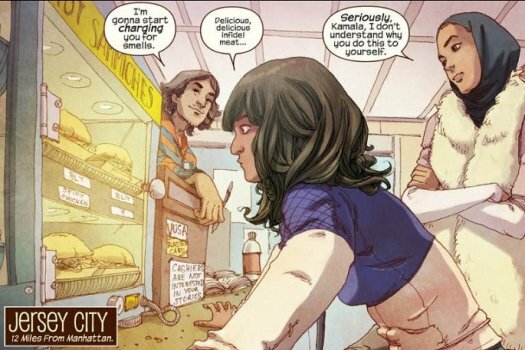 Alphona’s somewhat comic figures balance Kamala’s real-life conflicts with Wilson’s wit, drawing us deeper and deeper into the story. Note that while this is a reboot, readers do not necessarily need to know the original story. It may help, though, as there are some gaps in the beginning of the story. That said, Ms. Marvel is engaging for all readers (tweens and up) and is full of wonderful witticisms and humor while subtly introducing diversity in a previously told but equally engaging story. The fact that while a Muslim and a polymorph, what shapes and drives Kamala are her personality, her parents’ teachings, her inner strengths and her values — not her labels. In Ms. Marvel: No Normal, Kamala, a sixteen year old Muslim Pakistani-American, has a “sad nerd obsession with the Avengers” and tries to bridge her Muslim world and friends with the Jersey City kids with which she goes to school. 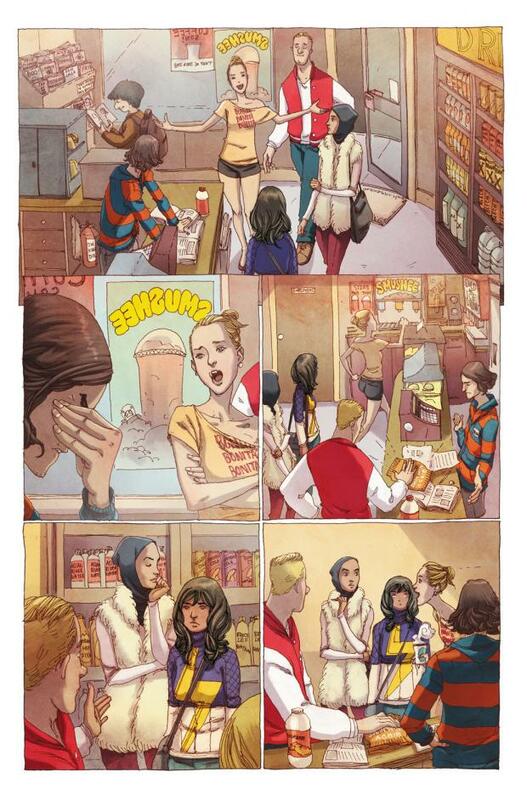 The book opens with Kamala and her friend Nakia in the Circle Q convenience store talking with Bruno (Kamala’s “second best friend”). Zoe and her boyfriend Josh walk in, and Zoe, all peaches and cream, condescendingly patronizes Kamala and her friends while inviting them to a waterfront party. While Nakia has no interest in attending because they’ll be drinking alcohol. which is against her religion, Kamala wants to go. 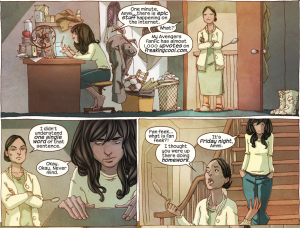 Despite the fact that Kamala’s parents refuse to let her go, she sneaks out and goes anyway. 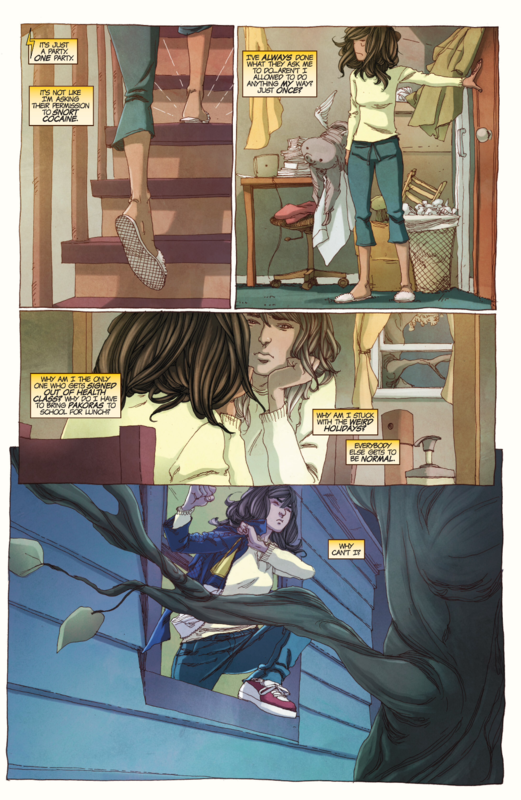 While she sees and approaches Bruno, Zoe comes over to her, openly insults her, and Kamala runs away after they trick her into drinking alcohol. 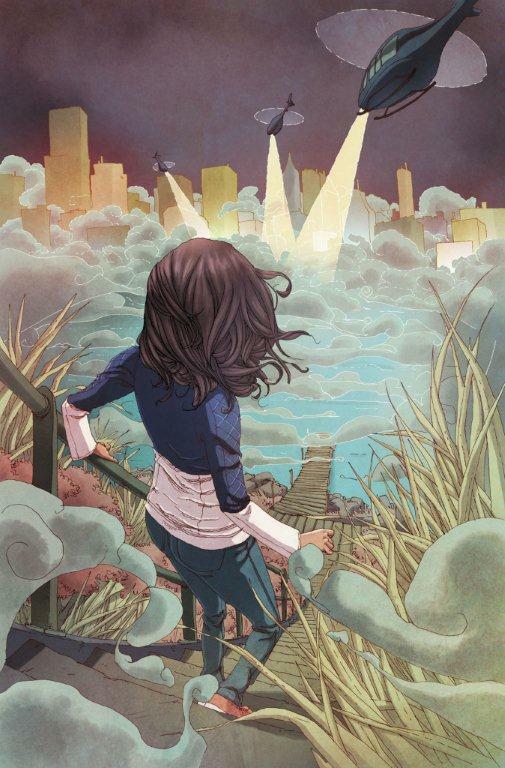 As she runs away, a mist envelops Jersey City, and Kamala meets the Avengers. 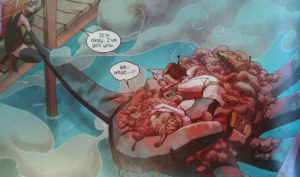 The first issue ends with Kamala finding herself trapped in a cocoon. As she punches her way out, she realizes she’s been turned into Captain Marvel. She’s got the white skin, blond hair, and tight-fitting, body-revealing costume — all of it. In the third issue, Kamala finds out she (looking like Carol Danvers’ Captain Marvel) was on television and worries about being found out. Even though as Captain Marvel she looks nothing like Kamala, she worries that she’s been discovered when she herself doesn’t know how or why all this is happening. She is also still trying to learn how to control her powers while wrestling with how to deal with Bruno and his “betrayal.” As she walks over to the Circle Q where he works, hoping to talk to him and work things out, she sees he’s being held up. She texts the police and then enters as Captain Marvel to save the day. Instead, she gets shot. 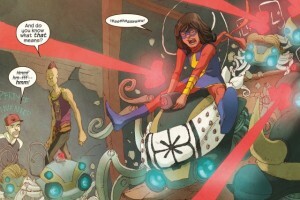 In the fourth issue, Kamala finds that as a polymorph, she can heal quickly as long as she doesn’t morph. While Bruno begins to call for an ambulance for Captain Marvel, Kamala tells him its her. She morphs to Kamala and begs him not to call for help. 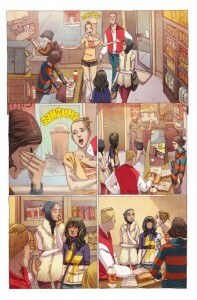 As Bruno learns Kamala’s secret, Kamala learns that Vick, Bruno’s younger brother was the one holding up the store. 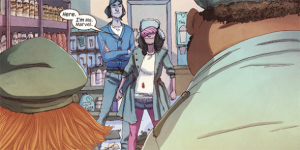 They keep Vick’s identity a secret, and Kamala tells Bruno she wants to help. Bruno, after some convincing, agrees to let Kamala help and tells her that Vick usually hangs out at an abandoned house in Greenville. That evening, before going to rescue Vick, Kamala realizes she needs to be herself and not Captain Marvel. So she changes her costume and super hero look. She now is dressed in modest super-hero attire, wears high top sneakers instead of boots, and keeps her dark hair and complexion while changing her superhero name to Ms. Marvel. With her transformation complete she goes to rescue Vick only to realize that the guardian of the house, Doyle, has creepy “kitty” robots that overpower her. She shrinks to a mini-size to escape and regroup. 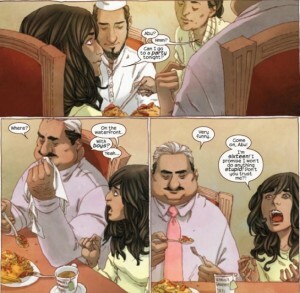 Kamala also finds that her father’s teachings of the Quran give her the vision and strength to use her powers. Just before deciding to rescue Zoe, she remembers a passage from the Quran: “Whoever saves one person, it is as if he has saved all of mankind.” She soon learns that while she may look like Captain Marvel on the outside, that’s just a costume. What’s inside is Kamala, and part of who Kamala is — her family, her religion, her friends, and her ethnicity — are what ultimately guide her and help her realize who she is and how she fits in. 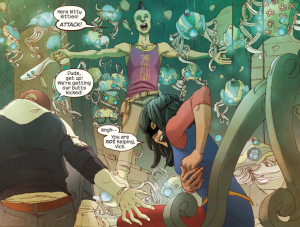 While Wilson and Alphona have created a superhero comic in the classic Marvel mode, they offer a more progressive perspective in the characters, text, and artwork. Alphona provides a wonderful balance of gravitas and whimsy in his art, keeping the tone light and fun with his cartoonish-y exaggerated character expressions and flourishes. Balancing this quirkiness is Wilson’s insightful text filled with imagery of its own. Alphona’s cartoonish characters, fashion details, and use of color are engaging and add a delightful depth, complementing Wilson’s highly expressive, real-life text. All this enables readers to embrace the diversity of their characters while adding a breath of fresh air to this rebooted story. Whether used in classrooms or just read for fun, there is great depth of character and this book provides a wonderful look at the balancing of family, religion, and pop culture that all tweens and teens deal with. Plot and discuss Kamala’s goals and dreams. How do they change over the course of the book? Discuss the various ways people can be different, and the challenges they face as a result. Discuss what it is that makes Kamala different and what makes her like the other Jersey City kids. Discuss why it is so difficult for her to fit in. Discuss why it is difficult for various “different” people to fit in and what your class and community might do to help. You may want to discuss Joseph Campbell’s monomyth (see related links below) and how Kamala does/does not fit into the mythic “hero” stereotype. Search for and discuss Wilson and Alphona’s use of verbal and visual metaphor throughout the book. Explain how it is used to tell Kamala’s story. Discuss what Carol Danvers means when she tells Kamala, “You’re about to get the kind of total reboot most people only dream about. But it is not going to turn out the way you think.” Discuss how Kamala thinks it will turn out, and discuss how and why things don’t always turn out the way we expect. Discuss /debate: “Maybe putting on a costume doesn’t make you brave. Maybe it’s something else.” Deliberate what makes one brave. What does it take to be a hero? As Kamala adjusts to her new image and powers, she wonders, “What if I don’t fit into my old life anymore? Like it’s a pair of jeans I’ve just outgrown?” Discuss if /when your students have felt this way and why. What did they do to find their way and adjust? Discuss Wilson’s use of simile here as well. As Kamala comes to realize that her Ms. Marvel image has to relate to her, she notes: “Abu is right. Bruno was right. I’m not here to be a watered-down version of some other hero… I’m here to be the best version of Kamala.” Discuss what this “best version” of Kamala should be. Have students/readers evaluate what their “best version” of themselves might/should be. 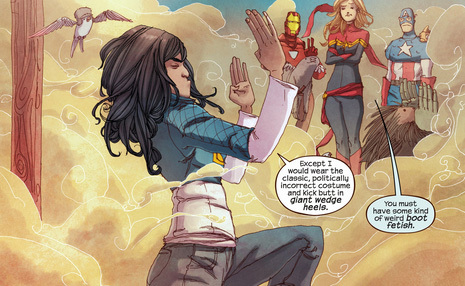 Discuss why Kamala tells Captain Marvel she wants to be like her. Why like Carol Danvers and not someone else? Search, find, and discuss Wilson’s use of metaphor throughout the book. Search for and discuss the many instances of irony across the stories and how it is used to shape the stories. Search for Wilson’s use of Arabic throughout the book. Discuss how it helps tell Kamala’s story. Discuss why it is so difficult for Kamala and Nakia to fit in. Discuss why it is difficult for “different” people to fit in and what your class and community might do to help others in your community belong. Discuss the similarities and differences of Muslim customs versus American and/or any other cultures or religions represented in your classroom/community/reading group. Discuss what it is like to feel and to look “different” from others and the importance of “fitting in.” Conversely, discuss the importance of being oneself. Then, discuss what people might do to reach a comfortable balance between the two. Discuss how cultural values can shape who and what we are. Have students share their own cultural folklore. Compare and contrast how the stories are told/ written. Discuss and evaluate Alphona’s use of costume and fashion to depict his characters. Have students hunt for visual and verbal examples of stereotyping throughout the book. Compare and contrast the visual and verbal means used to portray and to debunk these stereotypes. 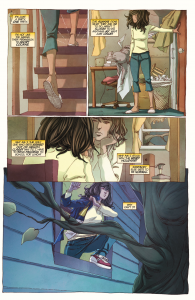 In Issue #3, as Kamala tries to control her morphing in school, discuss how Alphona draws the supporting characters outside in the hall. How does this help tell the story. Evaluate and discuss Alphona’s use of color to portray moods, settings and locations. D’Aulaires Book of Greek Myths by Ingri and Edgar D’Aulaire: An introduction to the gods and goddesses of ancient Greece. Note that George O’Connor (First Second) is also putting out an exceptional collection of graphic novels accurately and creatively accounting the stories of the Greek gods. When reading these Greek Myths, discuss how Kamala’s story does and does not parallel these myths. The Absolutely True Story of a Part Time Indian by Sherman Alexie: About a bright, motivated young Native American who must decide about commuting to a better all-white school off the reservation and face ridicule by the white kids he must befriend and from his local friends he leaves behind, or remain with his friends, who are heading nowhere fast. Compare and contrast how the characters from different cultures strive to fit in. American Born Chinese by Gene Luen Yang: About a Chinese boy who struggles to fit in with his American classmates. Compare and contrast how Jin Wang and Kamala are similar/different and how they struggle to be American. Persepolis by Marjane Satrapi: About a teenage girl growing up in Iran during the Islamic Revolution and the ways in which religious and cultural upbringing can conflict with the trials of being a teen. Captain Marvel, Young Avengers, and Captain Marvel: Earth’s Mightiest Hero: Marvel comic series. Compare and contrast these Avenger/Captain Marvel series. The Outsiders by S.E. Hinton: A story about the social divisions among kids and the mechanisms that drive their rivalry. The Chocolate War by Robert Cormier: A story about a kid who defies social convention in his school and the subsequent fallout from his actions. 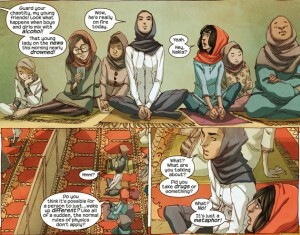 http://www.npr.org/blogs/codeswitch/2013/11/11/244529591/what-the-new-ms-marvel-means-for-muslims-in-comics — “What the New Ms. Marvel Means for Muslims in Comics,” a look at the impact that Ms. Marvel has had and may have on the comic book industry. http://marvel.wikia.com/Carol_Danvers_%28Earth-616%29 — Marvel’s online database page the history of the Carol Danvers character. http://marvel.com/videos/watch/4590 — Listen to G. Willow Wilson talk about Ms. Marvel as Alphona’s glorious images and thumbnails flash on the screen. You may want to use this as a jumping point to have students discuss how they might promote a creative piece they’ve written/drawn/created. http://www.tolerance.org/magazine/number-10-fall-1996/feature/our-own-words — A resource for teaching tolerance. http://www.thewritersjourney.com/hero%27s_journey.htm — Resources for defining Campbell’s Hero’s Journey (outline, archetypes, notes). http://www.moongadget.com/origins/myth.html — Fascinating chart and article comparing characters from Star Wars and The Matrix with Campbell’s Hero’s Journey found in his The Hero With a Thousand Faces. All images (c) Marvel Entertainment.